It’s the first Five and Peri story since Planet of the Shorts! And it’s Nicola’s revenge, portraying Peri as the assertive, intelligent botany student she was originally hired to play. In Red Dawn, Peri and the Doctor gatecrash one of the first human missions to Mars. Luckily, the humans (with an American accent that actually sounds American, wonder of wonders!) are too busy dealing with crises to be overly miffed that Someone Else Landed Here First. Unluckily, Doctor Who canon established that Mars was inhabited, so Big Finish can roll out another classic Who mainstay, the Ice Warriors. The pseudoscience made me cringe now and again, but I honestly enjoy Red Dawn, the more so on re-listens. It’s a simple first contact story with good to superb guest characters, some amazing visuals for the imagination, and action and interpersonal conflict alternating with ethical dilemmas and moments of courage. I really like the Ice Warriors in this: fierce but honourable, with some nuances beyond what we saw on TV. The human crew are a bit clichéd, with the wholesome character, the shifty character, and the character who’s more than he/she appears, but they work fine for what they are: a critique of human virtues and character flaws from an alien’s point of view. 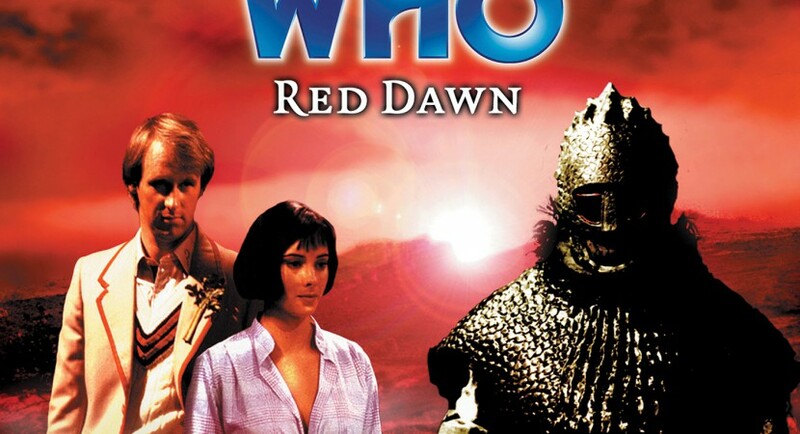 Red Dawn feels more like a stage play than modern Who, with minor twists and turns and the Doctor trying desperately to keep humans from doing anything stupid while Peri is anything but stupid. I know some fans don’t like Red Dawn because it’s slow, simple, and fairly predictable. For me, it feels like a very typical classic Who with a better portrayal of Peri. The main problem I have is that, as with many classic Who aliens, the Ice Warriors’ ponderous speaking style is a little distracting, but after a while one stops noticing. Actor alert: the earnest young geologist in this is played by Georgia Moffet, Peter Davison’s daughter, four years before RTD reportedly turned her down for the role of Rose Tyler because she was too young. You may want to pick up Simon Hodges’ custom cover art for Red Dawn (and browse his gallery; he’s done excellent custom covers for most of the early Big Finish audios). What makes this audio work for me is that Lord Zzarl is a convincing “honourable warrior” archetype with enough charisma to overcome the stylised voice. His final scene with the Doctor is satisfyingly noble and heroic. Sometimes it’s fun to dispense with postmodern irony and gritty realism and fall back on the quasi-mythic character tropes and stereotypes that classic Who used to do so well. First Peri and Fifth Doctor audio adventure. Production Code 6Q/A. The next Peri & Five audio after this in their timeline is probably Exotron, although in fact, The Eye of the Scorpion and other audios with Peri and Five joined by new companion Erimem were recorded first.